As a 7.0 earthquake rolled across Alaska on Friday, students cowered under desks and took to social media to share their experiences in real time. 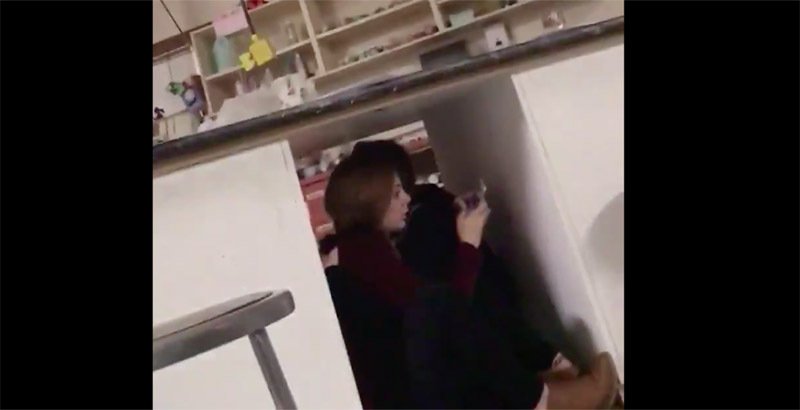 Alyson Petrie of Colony High School posted a video to Twitter while she and her classmates took cover under tables in an art classroom. At least eight aftershocks followed the initial quake, one as strong as 5.7, CNN reported. The quake hit around 8:30 a.m. local time near Anchorage. Some students surfaced fears about whether a tsunami could be coming. A tsunami warning was briefly in effect but was later canceled. Here’s what it looked like inside some schools during the quake. Teachers and parents also shared updates as the morning unfolded. The Anchorage school district instructed parents to pick up their children when they felt it was safe to do so. Some students were evacuated to other schools to wait for their parents. Dramatic images also showed roads torn apart as well as homes and workplaces thrown into chaos. No injuries or deaths have been reported, but the earthquake did damage many buildings and other infrastructure, according to local media reports. Alaska governor Bill Walker has declared a state of emergency. Almost exactly 24 hours earlier, another earthquake struck the Pacific rim of the U.S., this time at the furthest point south. Thursday’s 3.9-magnitude quake near San Diego was felt as far as Mexicali, Mexico, but no injuries or damage were reported.